This post is based on a class presentation that I gave a few weeks ago as part of my educational psychology studies. 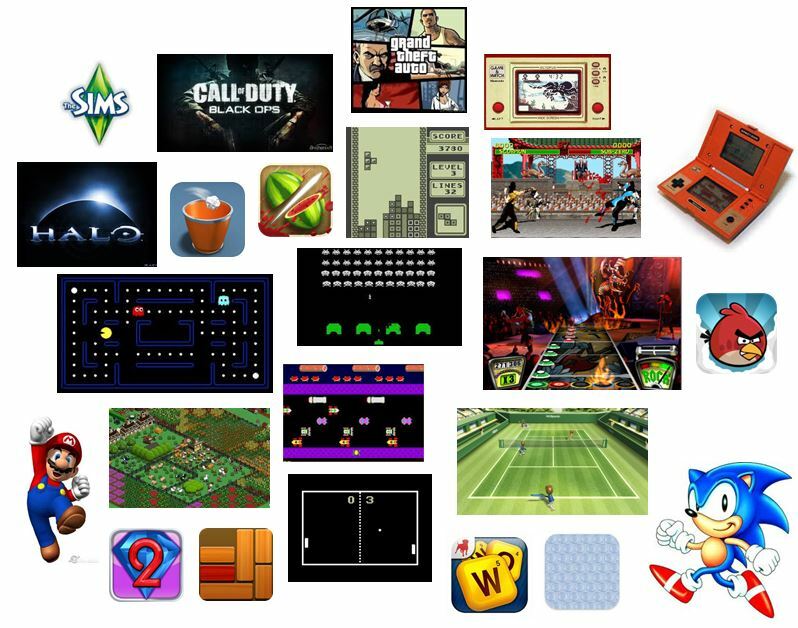 My topic was ‘Video Games and Motivation’ and I looked at the research that has been done into the motivational pull of video game play and then linked this to gamification, which seems to be an increasingly popular technique being used in e-learning and other educational settings. From a personal perspective, learner motivation for e-learning is an important issue because its use in organisations is becoming more widespread. In a TED talk on gaming, Jane McGonigal said that globally every week people spend 3 billion hours playing video games1. According to a Digital Australia report, it is estimated that by 2015 the global annual spend on video game activity will exceed $90 billion2. This is a huge amount of time and money spent playing video games. Most people who engage in video game play choose to do so voluntarily, because it is fun and they enjoy it. If people engage in activities because they enjoy them or find them interesting, then these activities are said to be intrinsically motivating. So for most, video game play must be an intrinsically motivating activity. One particular study has shown that motivation to play video games (regardless of the game type) is accounted for by how well the game satisfies our basic psychological needs of autonomy, competence and relatedness3. As a term, gamification has existed for a few years and is defined as “the use of game design elements in non-game contexts”4. While some have interpreted gamification as turning learning experiences into games or adding games to learning experiences, the intent of gamification is not to create a game but to use elements of game design to increase motivation and encourage the learner to engage with the content. As video games involve the use of technology, it would seem that gamification would be readily adaptable to e-learning modules or virtual learning environments (VLE). While gamification has been met with some criticism, it seems it’s more the application that’s the problem rather than the technique itself. This is because some applications have an aesthetics focus rather than a mechanics focus i.e. the balance between the two kinds of elements is weighted incorrectly. This is demonstrated by only using a scoring system or badges or leaderboards to make learning more game-like. Points and leaderboards assume that everyone likes to compete and be ranked but this is not always the case and if it’s not particularly challenging to accumulate points and badges it won’t be very motivating at all. It’s also lazy from a design perspective, as these things are easy to add-on. The mechanics of video games (while taking more time to design) allow for much more variety in terms of the learner experience. Points and badges and leaderboards will be the same from module to module but more can be done with different rules, goals, challenges, mystery and control options, which results in a different experience for each learning module. An article that I read recently said, “the key to gamification is turning extrinsic rewards to intrinsic rewards”. I would say that this statement is problematic because intrinsic and extrinsic rewards are so different. The intrinsic reward is your enjoyment as opposed to an extrinsic reward, which is something separate from the activity. People generally play games because they want to. People generally complete formal learning at work because they have to (it might be compliance training or to address a skill gap). These are the opposite in terms of reasons for engaging in learning. So even if the learning is gamified, will it have any effect on engagement if the learner is doing it because they have to? Also, gamification would benefit from further research into the motivational gains that should result from its use. So, is gamification the answer to improving learner motivation when learning online? I think it could be but like all learning, it needs to be designed with the learner as the focus. The approach to gamification for a short stand-alone module would be different to a virtual learning environment (VLE). If we want to truly utilise gamification to its full potential we need to design learning experiences that satisfy basic psychological needs. I’m all for embracing new ways of doing things because they work and not because they are popular. I definitely believe that gamification a solution; it might be too early to tell if it’s the solution. Have you used gamification in your e-learning projects? What did you do? Can any topic area be gamified? 3 Ryan, R. M., Rigby, C. S & Przybylski, A. K., (2006). The motivational pull of video games: a self-determination theory approach. Motivation and Emotion. 30, 347-364. 4 Deterding, S., Dixon, D., Khaled, R. & Nacke, L. (2011). From game design to gamefulness: defining “gamification”. In Proceedings of the 15th international Academic MindTrek Conference. 9-15. This doesn’t suprise me at all, as it is an incredibly complex exercise to develop an effective gamified application; and with all the current hype around it, many are simply slapping on points, badges and leaderboards (PBLs) and calling it gamification. Whilst this actually CAN lead to short term increases in the desired behaviour, it’s bound to fail in the long term (re sustained behaviour change) because it uses extrinsic rewards to try to motivate. The quote you’ve included about “turning extrinsic rewards into intrinsic rewards” may have perhaps confused intrinsic rewards with intrinsic motivation – there’s a difference. Ultimately, what successful gamification often does is (at least initially) use some form of extrinsic reward (e.g. status components like PBLs, real time feedback, or whatever), but it does so in such a way as to enhance intrinsic MOTIVATION that players already have. And successful gamification usually does this by using game mechanics to develop competence, autonomy, relatedness (sound familiar? > SDT!) – which has been shown to ehance intrinsic motivation. So, for example, Nike Plus enhances the experience of running for people who already run, or ppl who want to take up running, or ppl who know that running is good for them but can’t be bothered to get up off their butts to do it regularly through mechanics like real time feedback (> helping to devp competence), ability to share achievements with others (relatedness), personalised suggestions / challenges to improve (> autonomy) [actually not sure if does the last one, but this is common to many gamified apps! So it should!]. THUS these mechanisms, which could be viewed as extrinsic rewards, are designed to enhance intrinsic motivation — potentially to the extent that eventually people will sustain the behaviour change (making running a habit) even without the app. That is the true measure of success for a gamified app. So the key thing that good / successful gamification does is tap into this intricate relationship between extrinsic rewards and intrinsic motivation. To do this well, you really do need to understand your players (or ‘learners’) and what drives them – is there any or enough intrinsic motivation already present for the extrinsic rewards in your gamified app to work? THIS is why just slapping on PBLs onto anything and everything just won’t work. At least not in the long term. It’s also why although, it CAN be a very effective solution, it’s certainly not an EASY solution to implement – there are A LOT of factors at play that determine whether a gamified app will be successful! It’s an absolutely fascinating topic – because it’s just such an intersect of psychology, marketing, business & education. Well…that’s probably enough for now! Thanks Tanya! I find gamification really interesting too especially trying to bridge the gap between the theory behind it and putting it into practice. I’d say it would be quite a difficult task in designing, especially for the workplace, given the many demands – different learner types, content/topic area, resources and development time available. Also, looking at the Nike example, the three groups you mentioned would have different types of motivation on the SDT continuum, so I’m sure it would be a challenge to design an app that caters for all three. Do you know of any samples of gamification of workplace e-learning that are available to look at? Hey Matt, re – catering to different groups with different characteristics and goals – this can be done via gamification through challenges and/or goals, which is another common feature of gamified apps – e.g. having players determine their own goals, embark on preset challenges within the game that appeal to various players in the target audience, have people challenge each other to meet goals > building in autonomy (by allowing players to determine or choose their own goals in the game), fostering competence (by having them set and meet goals / challenges they are intrinsically motivated to undertake), and relatedness – having them set or meet goals with others. * making the experience fun – this is the essence of games – they need to be intrinsically enjoyable; people are doing it not because it’s mandatory, but because they find it enjoyable. This approach may end up being defined more as ‘game based learning’ than ‘gamification’, but whatever – there’s so much confusion around terms and definitions that I don’t think it’s worth worrying what you call it.